The number of Chinese students enrolling on American campuses continues to increase, although at a slower pace. 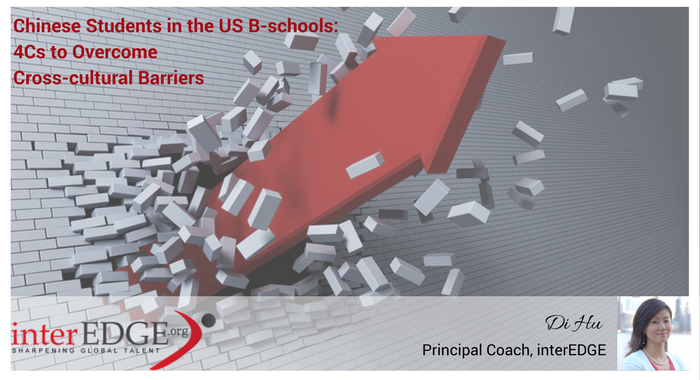 One area where we observe the most predominant growth is in business schools (B-schools). According to DrEducation, the number of Chinese students pursuing a management or business degree grew by 160% from 2009/10 to 2014/15. In comparison, India and South Korea, the other two of the three top source countries of international students witnessed 11% and 13% decline. With the rapid growth of Chinese students on American campuses, more than a few institutions face pushbacks from the domestic students or local communities, towards a student body dominated by foreigners from one particular country. The commonly known challenges for Chinese students include social barriers, campus integration, and career development. These three factors profoundly harm not only Chinese students’ experience in the U.S. but also the physical and emotional well-being in the important forming years of an individual. To battle these three challenges, intercultural competence stands as one key solution. A deeper understanding of contexts and characteristics of Chinese students can help us design solutions for the success. In the analysis of GMAT data by Dr. Rahul Choudaha, the co-founder of interEDGE, it is indicated that the majority of Chinese students (73%) intended to pursue non-MBA master’s programs (e.g. finance and accounting) as compared to traditional two-year MBA programs. Also, there are two unique demographic characteristics of Chinese students pursuing business management degrees, comparing to their domestic peers. Chinese students are more likely to be younger, fresh out of college with little work experience.The mean age of Chinese citizens was 23.1 years whereas American students’ mean age is 26.5 years old. Compared to 26.5 years for the American students. This translates into lesser life and work experience, it may be more challenging for Chinese students to find job and internships in the US employment market. Female students from China are more likely to take the GMAT test. Female population formed nearly 67% of Chinese citizens taking the GMAT test. In contrast, only 39% American citizens taking the GMAT test were women. This means that the gender differences in communication style, and confidence can make it more difficult for female Chinese students. Based on my personal experience of growing up in China, as a former graduate student in the US and as a coach of many Chinese students, I believe that the lack of exposure to cultural diversity is one of the key reasons that result to the struggles of Chinese students. Chinese students have experienced limited exposure to cultural diversity before their study abroad experience. Homogeneous society: Due to certain historical, political, and socio-economic factors, China has become a very homogeneous society ethnically, religiously, and culturally. Homogeneity is considered helpful for internal harmony and combating external threats. Overseas travel: Overseas tourism emerged as a new phenomenon in China in the recent years. Although growing at a rate of 20%, in 2016, less than 10 % of the whole population traveled abroad. Not to say mostly to Asian countries. A combination of these unique characteristics can hinder classroom engagement, likewise the career readiness of Chinese students. For example, B-school academic experience requires class participation. However, the sociocultural factors suggest that Chinese are most likely to be reluctant in speaking up and engaging in group projects. This same mindset hinders their ability to build and expand their network and results in a less proactive approach to their job and internship search. Foreign festivals, cultural events, and factsheets teaching cross-cultural differences offer an interesting peek to cultural diversity but barely touch the intercultural competence building. It affects how Chinese students present themselves in ways that fit the American culture. Although confidence is a recognized virtue, each culture has its own customized expression strongly shaped by particular beliefs. Most Chinese, individuals of a collectivist society deeply rooted in Confucian philosophy, are taught to express confidence only when it is considered socially appropriate and when it contributes to the harmony of the relationship. In comparison, American expression of confidence is more individualistic and independent. It is encouraged and taught as one top factor determining one’s success. Communication shapes how Chinese students interact with professors, classmates, roommates, and potential employers. Communication never occurs in a vacuum but always during an interaction. An interaction between two people invites diverse cultural interpretations. One may assess whether it is of equality, superiority, or inferiority. Chinese communicate between lines, allowing rooms for interpretation and ambiguity. It carries a heavy layer of formality to show respect and recognize seniority. To the contrary, formality and ambiguity are the last to be desired in the American context of as-a-matter-of-fact communication as it seeks efficiency, clarity, and precision. Human relationships are not only what makes a study abroad experience memorable, but also what international students will carry with them for a lifetime. The action word “network” offers horrific cultural misinterpretation if we translate it literally to Chinese. Guanxi, a Chinese word for network or networking, indicates a heavy reliance on inherited social capital, under-the-table transaction, and calculated opportunities, which often out rule competence, skills, and capability. On the other hand, the American concept of networking offers genuine opportunities to earn credibility and trust in either a personal or professional arena; however, requires strategic planning and sincere commitment to which few Chinese students attach importance. American institutions must not devote its all effort to recruiting and admission, but take the responsibility to provide training and support to Chinese in B-schools with intercultural competence. With improved cross-cultural understanding and skills, Chinese MBA students will become more active participants in classrooms and equal players in group projects. They will be more successful in making friends and broadening their circles as they socialize with Americans and students from other countries. Furthermore, they will adapt themselves more effectively in seeking professional growth. Previous How Studying in the US affects Chinese Students’ Leadership Style?